Our Best Wishes: Happy Chinese New Year. Seven Fascinating Watches Celebrating the Year of the Horse. Today, with the first new moon of the calendar year, the Lunar Chinese New Year will begin its 15-day celebration. A 12-year-cycle of animals make up the Chinese zodiac and these interact with the five elements: wood, metal, fire, water, earth. 2014 is the year of the wood horse, taking over from the year of the water snake. In order to commemorate and celebrate the Year of the Horse, several manufactures have released limited edition timepieces. For this occasion, we have picked seven fascinating watches that take the center stage today as the Year of the Horse gets kicked-off. Let's start with the Vacheron Constantin The Legend of the Chinese Zodiac 2014 Year of the Horse crafted in 18K pink gold or platinum and limited to 12 pieces each, that will only be sold at the Vacheron Constantin Boutiques. Fitted with a case measuring 40 mm in diameter and an automatic movement, the dial on this watch features a leaf motif, stemming from classic Chinese iconography, and directly engraved in the gold dial. The pattern remains semi-embedded and stands out from its gold base by a subtle stage-setting of variously accentuated reliefs creating a depth effect. The raised bamboo stalks appear to be floating over the dial. With the horse engraving, on which the details of the mane and coat measure a mere fraction of a millimeter, the artisan provides a tangible expression of the artistic vision behind this creation. Then comes the stage of 'Grand Feu' enameling, a technique invented in Geneva and which remains the exclusive preserve of a rare breed of artisans. By applying the enamel in successive layers, the enamel specialist further enhances the visual intensity of the blue or bronze-toned dial. A final layer of enamel is then applied before a final firing operation that vitrifies the dial and lends a shiny glazed effect that gives added definition to the floral motif. The horse is delicately applied to the center of the dial, poised as if ready to gallop through the sapphire crystal and thus creating a truly striking effect. For more info on Vacheron Constantin click here. Three exclusive Jaquet Droz timepieces have been created using the exclusive know-how of Jaquet Droz's master craftsmen, specialized in highly complex techniques: engraving, painting and Grand Feu enamel. Two Arab thoroughbreds – considered the most beautiful horses in the world – have been delicately painted on the ivory enamel dial of the Petite Heure Minute 39 mm. Captured in full gallop, they seem to want to catch up with the sculptural mustang that appears on the dial of the Petite Heure Minute 43 mm. Extremely wild and difficult to tame, this horse from the American Northwest —depicted in red gold and engraved in bas-relief— seems to jump out from the black enamel. The champlevé technique, used here for the first time by Jaquet Droz, highlights the movement of the mane and the tail, both filled in with black Grand Feu enamel. 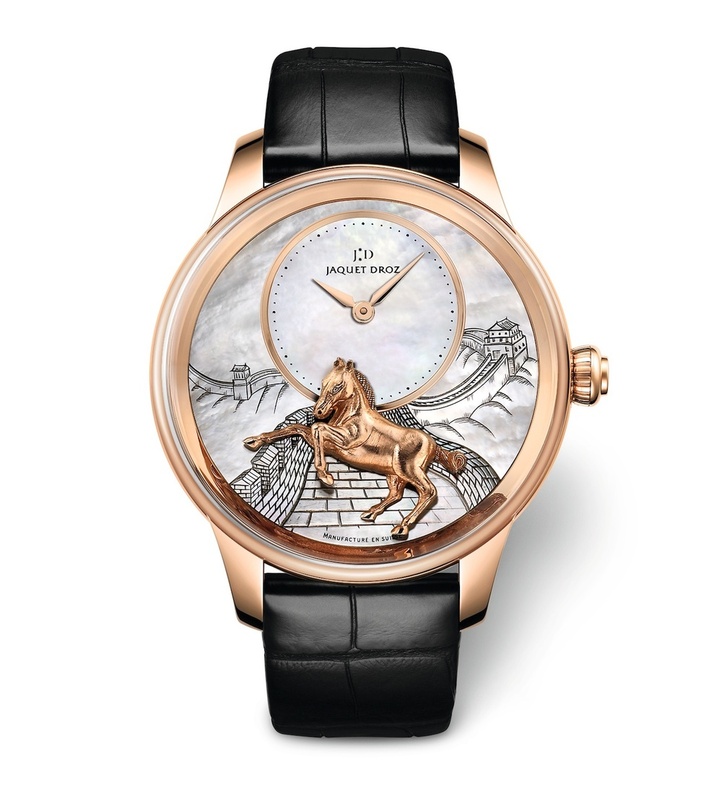 The Jaquet Droz Petite Heure Minute 41 mm has been chosen as the showcase to depict a horse rearing up on its hind legs against a backdrop of the Great Wall of China, engraved and patinated by hand on a mother-of-pearl dial. Bold, powerful and elegant, this fearless horse in 18-carat red gold appears to protect the Great Wall, which is also hand engraved on the 22-carat red gold oscillating weight next to the Jaquet Droz signature of two stars. For more info on Jaquet Droz click here. Lastly, Arnold & Son unveiled the HM Horses Set in honor of the Chinese New Year. The Arnold & Son HM Horses Set is a special limited edition of 28 pairs of watches inspired by the horses depicted in traditional Chinese ink-wash paintings. Adorning each of the two lacquer dials is a hand-finished miniature painting of two horses, one pair black and grey on white, the other white and grey against a black background. Nuances of tone and shading, from jet black to silvery grey, are achieved by the tiny brushstrokes and texturing gradually to build-up the entire image with an astonishing richness of details. The two watches in each pair of this limited edition from Arnold & Son are powered by the hand wound A&S1001 calibre, developed, designed and manufactured entirely at Arnold & Son's workshops in La Chaux-de-Fonds, Switzerland. The classical design is underscored by the slim 40 mm 18-carat rose gold case, which is also available with an optional diamond-set bezel. The simplicity of the black and white lacquered dials, which have just two hands and a minimalist chapter ring consisting of tiny dots, leaves the stage free for the dynamic miniature depiction of two charging horses. The timepieces are each presented with a high-quality black alligator leather strap. For more info on Arnold & Son click here. Posted on January 31, 2014 by Editor & Publisher and filed under News, Other Brands and tagged Vacheron Constantin The Legend of the Chinese Zodiac 2014 Year of the Horse Jaquet Droz Petite Heure Minute 39mm Jaquet Droz Petite Heure Minute 43mm Jaquet Droz Petite Heure Minute 41mm.